In August 2018 I visited Brazil, Paraguay, and Bolivia on a 3-week trip through South America. The trip was organized by Tucan Travel. 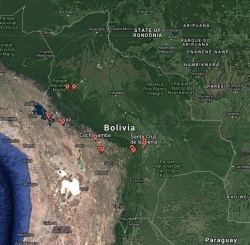 The organization of the trip was mostly well done, only in Bolivia did I have some glitches. Here is the report on the Bolivia part of the trip. Coming from Brazil, I flew into La Paz. The airport is at 4,058 m (13,314 ft) altitude, which takes some getting used to. 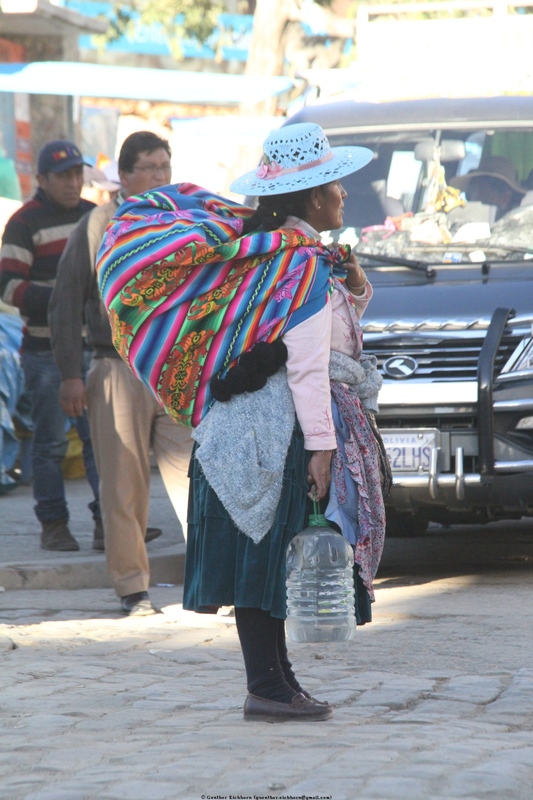 I was picked up at the airport and transferred to a hotel in La Paz for two nights. The hotel was at about 3,650 m (11,980 ft) altitude, so I knew I would have an uneasy night, I don't sleep well at such altitudes. The next morning we left early for a tour to Lake Titicaca. We drove to Copacabana on Lake Titicaca and took a boat to Isla del Sol (Island of the Sun). Lake Titicaca is at 3,812 m (12,507 ft) altitude. We hiked across some of the island, visiting an Inca temple, Templo del Sol (Temple of the Sun). In the evening we drove back to La Paz. The next morning I flew to Rurrenabaque to visit Madidi National Park. From Rurrenabaque we took a boat for a six-hour drive on the Beni River and Tuichi River to the Chalalán Ecolodge on the Chalalán Lake in the Madidi National Park. I stayed there for two nights. We did several hikes around the lodge and a boat tour around the Chalalán Lake. From Rurrenabaque I flew back to La Paz for another night, before continuing on to Cochabamba. From Cochabamba it was a four hour drive to the Torotoro National Park, where I stayed for two nights. The Torotoro National Park is know for its fossil dinosaur tracks. They were impressive to see. I did several hikes in the park, one of them to Siete Vueltas (Seven Turns), a site with lots of small fossils. After the four hour drive back to Cochabamba I flew to Santa Cruz de la Sierra, where I stayed for one night. The next morning we drove to Samaipata, a five-hour drive, where I stayed for two nights. Samaipata is an imposing site with pre-Inca, Inca, and Spanish remnants. On the last day we visited the giant tree fern forest, which was a six-hour excursion including a 1.5 hour hike through the forest. From Samaipata we drove back to Santa Cruz to catch my flight back to the USA. I saw incredibly varied areas during my visit to Bolivia, with the high Andes, the Amazon basin, the Torotoro mountains and Samaipata. Each area had its own interesting pieces, the Titicaca Flightless Grebe in Lake Titicaca, the bird life in the Amazon basin, the dinosaur tracks in Torotoro, and El Fuerte de Samaipata, the pre-Inca carved rock. There is lots to see in Bolivia. It seems to be a stable country with decent tourism infrastructure. It is well worth a visit. I may visit again to see the Salar de Uyuni a salt flat that acts like a mirror when it rains enough to produce a coating of water on top of the salt flat. I was in Bolivia during the dry season, so I couldn't see this effect. La Paz would have been nice to explore on foot, but I didn't try that. Most roads are steep on the mountain sides of the bowl in which La Paz is situated. At 3,600 m (11,810 ft) altitude I was not ready to walk up and down these steep roads. I would need a few days to get used to the altitude. I had pretty good food in most places. The restaurant with local food in La Paz was great, I liked those dishes very much. Beer is reasonable, German style lager like almost everywhere in the world. In the bigger cities it was a bit on the expensive side, but not too much. Bolivia has lots of different things to see. It is well worth a visit.